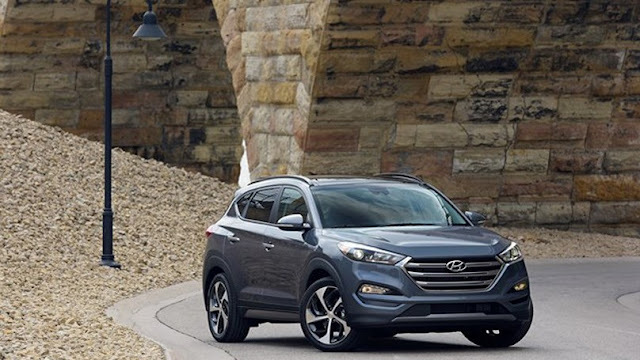 The U.S. Insurance Institute for Highway Safety’s (IIHS) has given its 2015 Top Safety Pick+ award to both the 2016 Hyundai Tucson (shown) and the 2016 Hyundai Sonata. In one of the industry’s most rigorous tests of vehicle safety, the 2016 Hyundai Tucson and Sonata both earned the U.S. Insurance Institute for Highway Safety’s (IIHS) 2015 Top Safety Pick+ award. This is the first time Tucson, which received a significant redesign for the 2016 model year, has received the highest honor from IIHS. IIHS rates vehicles for occupant protection based on performance in five tests: moderate overlap front, small overlap front, side, roof strength and head restraints. Winners of the 2015 Too Safety Pick+ award must earn good ratings in the moderate overlap front, side, roof strength and head restraint tests, as well as a good or acceptable rating in the small overlap front test. Vehicles also need an available front crash prevention system with an advanced or superior rating. Multiple advanced safety technology options are available on the 2016 Tucson, including AEB with pedestrian detection, Lane Departure Warning System, Blind Spot Detection, Rear Cross-traffic Alert, Lane Change Assist, Backup Warning Sensors and a standard rearview camera. Standard safety equipment on the 2016 Sonata lineup includes Vehicle Stability Management (VSM) with Electronic Stability Control (ESC) and Traction Control System, seven airbags, including a driver’s knee airbag, four-wheel disc brakes and ABS with Electronic Brake-force Distribution (EBD) and Brake Assist and Tire Pressure Monitoring System (TPMS) with indicators for each tire.